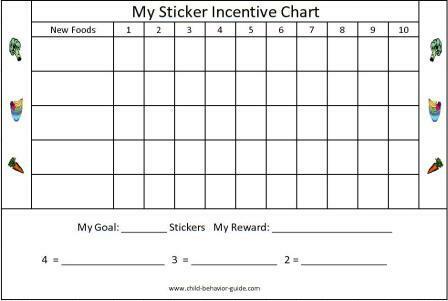 Download a free incentive chart for picky eaters and other printable reward charts to help provide positive behavior supports for your child. It can take 10-15 times of trying a new food before your child realizes it tastes good, so this will help to work towards at least 10 introductions for all items. Using sticker charts for children that often refuse to try a new food or other healthy foods for kids can be a great way to increase nutrition in your child’s diet. You may also find the tips and diets for picky eaters, helpful in eliminating all of your eating problems as well. List each food you would like your child to try and then provide him/her a sticker for taking one bite of that food. Pick out different prizes that can be earned for trying each item a certain number of times (2-3 would probably be good). Of course you may want to start with them just touching the food 10-15 times first and providing a sticker or reward for that. Prior to doing any sort of reward system for trying new foods, be sure to eliminate the possibility of any sort of tooth decay as the reason for picky eating. If there are undetected cavities etc. then this may be the reason they are refusing certain foods that hurt to chew. 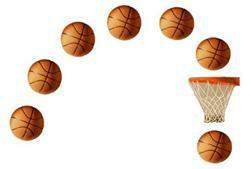 You will need adobe reader to download the incentive chart. A link to download this is below. You will need Adobe Reader (the latest version is recommended) installed on your computer in order to open it. You can get Adobe Reader here (a new window will open so you can download it without leaving this page, but you will need to temporarily disable any pop up blockers to open the new window and any free behavior charts). If you want to open the file in your browser window, click on the chart. However, if you want to download it to view later, then right-click on the link and choose "Save Target As" or "Save File As." Then select where you want to save it on your hard drive.